Agneta Horn is best remembered for her autobiography, often called Agneta Horn leverne, which was probably the earliest Swedish autobiography to be published. It was probably written in 1657. Agneta Horn was the first to publish an autobiography and it took a long time before another person followed her lead. Agneta Horn was born in 1629, into the Swedish nobility, into the heart of power, and into a world governed by the wars Sweden was engaged in during the first half of the seventeenth century. Agneta Horn was the daughter of Gustaf Horn, a general of the Thirty Years’ War who served Gustav II Adolf and Kristina during their minority government, and then served Queen Kristina directly during the Torstenson War in Scania from 1644 to 1645. Agneta Horn’s mother was Kristina Oxenstierna, the eldest daughter of Chancellor of the Realm Axel Oxenstierna and his wife Anna Bååt. 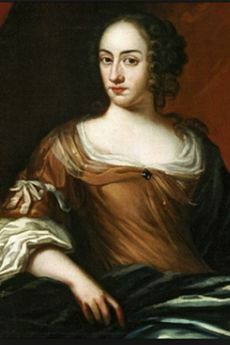 Kristina Oxenstierna, in accordance with the tradition of the time, accompanied her husband on his military campaign to Riga in Lithuania, which is where Agneta was born. Her brother, Axel, was born in Stockholm in 1630. When Gustaf Horn returned to Germany, his wife and two young children soon followed. Kristina Oxenstierna was alone in Stettin when she suddenly became ill and died in August 1631. Given this background one might expect that Agneta Horn’s account of her life would mirror the military and political events of the early Swedish period as a great power. This is not the case, although references to the wars do appear. Agneta’s autobiography focuses mainly on matters that concerned a noblewoman of her era: family births, deaths, engagements and marriages. Her text is stylistically reminiscent of genealogical annals. According to Agneta Horn’s account in Levernet – or, rather, Beskrifningh öfwer min älända och mÿket wederwärtiga wandringestidh – she and her younger brother were practically abandoned after the death of their mother. Only a single, lazy, and negligent servant girl was appointed to care for them. The children suffered two months of this maltreatment before their paternal aunt, Ebba Leijonhufvud, came to take care of them in October 1631. Axel Horn died shortly thereafter, and according to Agneta he froze to death because their aunt had sent them to bed in a room with an open window in the middle of winter. Agneta subsequently returned to Sweden and then spent alternate periods living with her paternal aunt, her maternal aunt Karin and her maternal grandmother. Levernet details how hard, miserly and negligent both her aunts were, beating her “once a day, sometimes three times”, whilst her maternal grandmother was portrayed as kind, generous and caring. Barely a third of the Levernet manuscript describes the trials and tribulations of her childhood until 1642. The remaining majority of the text focuses on the disputes engendered by Agneta Horn’s marriage plans – her struggle to avoid marrying the “fool” Erik Sparre and instead marrying Lars Cruus, “a brave soldier”. The line between the two themes, namely the tribulations of being an orphaned child, on the one hand, and the disagreements over her intended husband, on the other, is clearly the year 1642. That was when Agneta Horn’s father returned from a long period of captivity in Germany. She records how she immediately began to feel better: “ I have no cares in the world now. I am in receipt of everything that my heart desires and wants, and my dear father will not let me want for anything.” However, this period of happiness lasted but briefly. Not only did her father quickly remarry to Sigrid Bielke in 1643 but also her family decided that she should marry Erik Sparre. Agneta describes how her paternal and maternal aunts, along with her father, were the driving forces in this decision. In December 1645, as the dispute came to an end, Gustaf Horn informed Agneta Horn that she herself could announce her rejection to Erik Sparre’s sister, who had come seeking a definitive answer on the matter. Her father did not want to create an enemy as a result of his daughter’s decision. Agneta Horn was able to choose her own husband, despite the fact that she went against the wishes of both her father and the rest of her family. She was already wealthy thanks to her inheritance. Until 1653 she was Gustaf Horn’s only child, making her the sole inheritor of her mother’s significant dowry since her death in 1631. Agneta Horn married Lars Cruus in 1648. She accompanied her husband to Germany, and then on to Poland. In 1649 she had her first child, and this was followed in rapid succession by more children and miscarriages: three of her children survived to adulthood. Her husband died in 1656 during King Karl X Gustav’s Polish wars, and then her father suddenly and unexpectedly died in 1657, causing Agneta Horn to feel that she was suffering undeservedly. She gained some solace from inheriting a substantial portion of her father’s wealth as he had died before writing a proper will. Agneta’s stepmother initiated a legal case against her. The records of Svea Hovrätt show that Sigrid Bielke complained about her stepdaughter’s greed and disobedience – the disobedience was in reference to Agneta Horn’s wilful dismissal of a (potentially dubious) draft of a will which favoured Sigrid, and Agneta’s two half-sisters over Agneta. It is easy to see that Agneta Horn responds to these charges in Levernet with reference to the hunger and tribulations she experienced as a child, and in the lengthy reported speech sections between father and daughter, which are intended to show what an obedient daughter Agneta Horn had been. It is likely that the motivation to write Levernet came from the accusations her stepmother made during the trial. Agneta Horn’s autobiography provides evidence that she was a literary and gifted woman, whose talents for reported speech, scene-setting and descriptions of people are reminiscent of August Strindberg’s form of expression. The manuscript of Levernet was presumably inherited by Agneta Horn’s daughter Brita. It was then probably passed down, via several marriages, through the Sparre and Tessin families, until it came into the possession of the collector A. A. von Stiernman, who was the father-in-law of bishop Olof Celsius the younger. In 1885 the historian Ellen Fries discovered the manuscript in the Celsius collection at Uppsala University library. Fries’ version of the manuscript was published by the historian Sigrid Leijonhufvud in 1908 under the title Agneta Horns lefverne. Agneta Horn died in Stockholm in 1672. She is buried in the Sätuna funerary aisle of Björklinge church in Uppland. Agneta Horn, www.skbl.se/sv/artikel/AgnetaHorn, Svenskt kvinnobiografiskt lexikon (article by Eva Haettner Aurelius), retrieved 2019-04-18.